An upright, rounded shrub with lustrous, dark green foliage. The fragrant, pink, late winter blooms are held in rounded clusters before the leaves emerge. The foliage emerges with bronze tints and matures to deep green. The fall color is burgundy. It prefers a site in full sun to part shade in an average, well-drained soil. Avoid soils that are dry or wet. 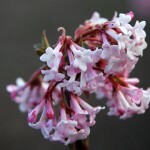 A nice three season shrub for the border, foundation planting or for screening.